This fall, Pete Chandrangsu joined the faculty at the Keck Science Department as an assistant professor of biology. 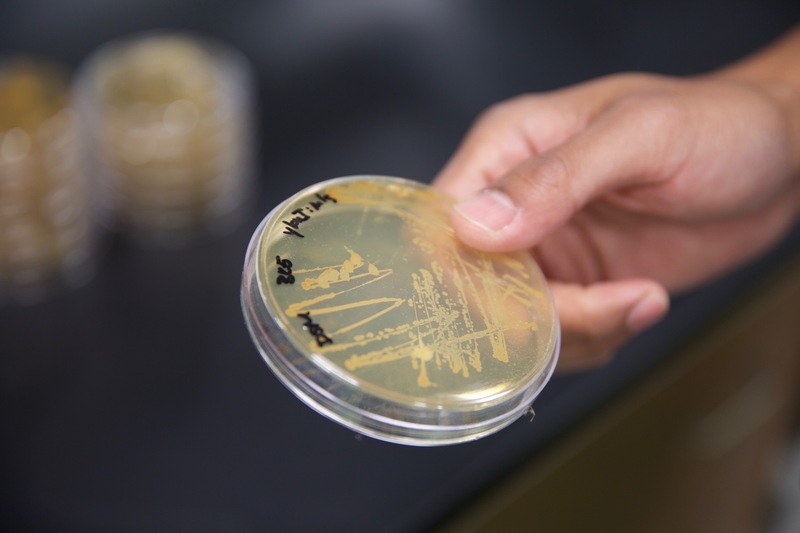 Coming to Scripps from Cornell University, Professor Chandrangsu’s research explores how bacteria respond to stress, and how that knowledge may have a positive effect on human health and disease prevention. The Office of Marketing and Communications sat down with Professor Chandrangsu to talk science, poly-gamma-glutamate, and classic cars. Scripps College: What is the main gist of your research? Pete Chandrangsu: I am interested in understanding the mechanisms that bacteria employ to survive a wide range of stressful conditions. My research is aimed at teasing apart how bacteria respond to transition metal stress, currently focused on zinc. Zinc is an incredibly interesting metal, since it is required for all life, yet it is toxic in excess. Amazingly, our immune system evolved to take advantage of both the requirement for zinc and its toxicity to prevent bacterial infection. Bacteria are amazing and have developed robust responses to zinc stress. The more we know about these systems, the more likely we will be to develop effective therapeutics that work with the body’s natural defense mechanisms. SC: How will you be bringing this research to Scripps, and how will students be able to get involved? PC: Students will absolutely be involved in all aspects of research! One of my goals as Scripps faculty is to provide students with the opportunity to explore and grow as scientists through experiences gained both in the classroom and the lab. Many of the intellectual skills learned in the lab will be useful to students, regardless of their future professions. In my postdoctoral work, I showed that bacteria secrete a sticky substance, poly-gamma-glutamate (PGA), to serve as a physical barrier against zinc. Bacteria unable to produce PGA are much more sensitive to zinc intoxication and are more easily cleared by our immune system. One of the projects students in my lab will lead is to tease apart how PGA production is regulated in response to zinc at a molecular level. There is still so much to learn! SC: What drew you to Scripps? PC: I have always been impressed with the truly interdisciplinary curriculum that Scripps and The Claremont Colleges offer their students. I believe that science is at its best when the contributions of people with diverse experiences, perspectives, and ideas are appreciated. I am most excited to work with students as they develop the skills necessary to identify and address society’s most pressing issues. SC: What led you to become a scientist? Punnett squares? The Krebs cycle in freshman bio? How does science continue to inspire you? PC: I am a naturally curious person, and my parents played a huge role in nurturing my passions by allowing me to explore and find my own path. I never had that one “aha” moment, but biology has always appealed to me because it is always evolving. Many of the things I learned in biology class have changed since I was an undergraduate. To me, being a biologist is amazing, because we are constantly exploring the unknown. SC: How do you like to spend your time when not stress-testing bacteria? PC: I enjoy working on older cars. I sold my 1971 International Harvester pickup truck before moving to Claremont, so I’m on the lookout for a new project!